My Grandma June died yesterday morning. It was not a surprise. She was 94, and had been living with alzheimers for many years. Last Saturday morning she turned a corner and we knew the end was near. I spent time talking on the phone to my mom when she called with the news, and then tried to process my own mixed feelings. But what filled me with the sharpest sadness was the thought of telling my girls when they came home from school. What do you tell your kids when someone they knew and loved has died? As my post earlier this week suggests, there is no “right way” to approach it. There’s only the most honest, true way you possibly can. I tried to help them grasp the Grandma June I knew most of my life, before she slipped into alzheimers. I told them how the two words I think best described Grandma June were “joyful” and “feisty.” She was able to see so much beauty and joy in everything around her, and yet she never let anyone walk all over her. When something mattered to her, it mattered deeply. I told them how determined Grandma June always was, and that she never wanted to give up, which was probably why she took a while to die. I said that Grandma June’s faith in God was stronger than anyone’s I knew. And finally I told my girls how confused I felt about Grandma June dying—that I was very sad, but I felt like I wasn’t feeling as much grief as I should. It had been so long since she was able to really enjoy her life, and respond to the love her family gave. I told them it was OK to feel whatever they were feeling. They might feel confused about their sadness, or about not feeling sad enough, but whatever they actually felt was just right. I have always recognized in you a sizable portion of who I was and am, as well as a significant aspect of who I wanted (and still want) to be. I could relate to your love for words and music and clothes, and to your quirky sense of humor. I could also relate to your feisty response to anything that ruffled your feathers, and to how that feisty attitude sometimes got you in trouble. You were transparent and opinionated, and you took life head-on. What I couldn’t always relate to, but was always drawn to, was your pure joyfulness in all circumstances, and your unwavering trust in God’s goodness. You were always a true light to those around you; somehow you managed to bring sunshine to people without ever downplaying life’s darkness and storms. You were a realist, without being cynical. I wanted—and still want—to be more like you. An open letter to Grandma C.
I love that in many ways you were prepared for this event. Nothing is ever as we think it will be when death actually happens, but I feel like you did the best you could in preparing yourself, and in talking to the girls. One of my favorite things about you is that you do think, and think deeply about difficult things. You encourage me to dig deeper into my own heart & thoughts. And you ARE feisty & opinionated, and I love you all the more for that. Your grandma lives on in you even as she joins those who have gone before. Blessings to you & your family. A great post, Kristin, and absolutely *right* to boot. I was surprised by the hole my grandmother left when she died two years ago. It wasn’t unexpected: she was 98, and while she didn’t have Alzheimer’s, she had been gently fading for a few years. Still, it hit me hard, in a slow-release kind of way. Grieving for my mother had been hard, too–but complicated, in all the ways that relationships between mothers and daughters can be complicated. Grieving for my grandmother was hard in its simplicity. I loved her, and she loved me: whatever I did, I always knew she was unconditionally (if not always uncritically) on my side. I don’t know you that well, but the spirit of your grandmother clearly lives on in the way you write and think hard about the big things that matter. The familiar formulas are often the truest ones: best wishes to you and your family in this difficult time. Kristin, I really love how you were honest with you girls about your own struggles with grief and your grandmother’s death. I think it’s important to remember that, while losing a loved one is sad, it isn’t always bad. I also like how you can find your grandmother in yourself – that’s one of the best ways to hold on to the memories. I’m so sorry to learn about your grandma! I know that this loss will leave a hole in your life and in your family’s life. Please pass on my thoughts and prayers to your mom and dad as it will undoubtably take me a few weeks to get a card/letter together. Children have such an amazing capacity for dealing with life and death. Your words to Q and S will help them to understand how confusing grief can be and that there are many ways of experiencing it. But, children also seem to have less of a hold on life (maybe because they’ve been alive for a shorter time) and can experience the loss more matter-of-factly. My daughter A is only turning 6 but has experienced 3 family deaths – one tragic and two expected/”natural” and the death of a cat. She often talks of life and death and what happens when someone dies, and I do the best I can, with my own unformed beliefs, answering her questions. It’s been interesting to watch how she processes and re-processes these losses each year as her understanding of life grows. A rarely talks about losing her Grandpa Tom (Dec. 2008), but when my mom visits, A will talk to her about whether she misses him and is lonely. I think my mom actually gets great comfort from these discussions; Q and S can provide that for you and your mom, too! 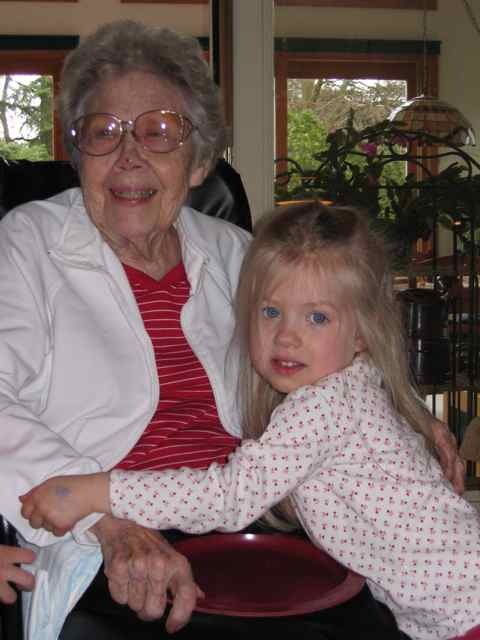 Kirstin, I love how you put this: “Grieving for my grandmother was hard in its simplicity. I loved her, and she loved me.” I think that’s very true about my relationship with my Grandma—there wasn’t anything complex about it, at all. When you think about it, there aren’t many deep, loving relationships that are pure. Usually lots of complexity comes with all the love. Anyway, thanks for your thoughts and wishes. Nicola, kids do seem to experience loss more matter-of-factly, in most cases. I think a lot of it depends on their personalities, though. My S is so very compassionate that I think she runs all of her emotions through a big “others filter,” which means she’s feeling all of this through me and especially my mom. Q, on the other hand, is very caring but is much more pragmatic and flexible with whatever life sends her way. She comforts people in a different way, without taking on all their sadness. Aren’t kids amazing? I love hearing stories about your A, too, and how she processes ideas and life. What a great tribute, Kristin. I’ve always been confused by the range of emotions I feel in response to someone’s death, but I suppose that’s why death is so complicated. I’m sorry to hear about your loss. I think the way you talked your girls through their emotions and grief was wonderful. It’s such a hard thing to explain to begin with and then adding your own feelings on top…well, it’s tough. I love that you share your memories with them too. It’s important for you all to keep those memories and good feelings at the surface, especially right now, during this hard time. It will help to get you through. Prayers and best wishes for your family. I had a brief but close relationship with my grandfather before he died, the rest of my grandparents, not at all, for various reasons, one being that one died before I was born. I love your grandmother’s attitude on life but like you, would give anything to see the joy in everything and to believe in something greater in me to help me know that it will all work out no matter what. I’m so sorry to hear about your Grandma, Kristen! I think it’s fantastic that you copped to being confused about your grief to your kids. It can be so powerful for them to know that Mom and Dad don’t always have all the answers, and that it’s OK if they don’t do everything just right, too. The Modern Gal, it is very confusing, but I think when you can put some sort of tribute into words (and put the confusion into words, too) it helps a lot. Robin, thanks for affirming me! It’s easy to second guess yourself as a parent, but when grief is involved, too, second-guessing is the last thing you need. We all need extra grace at such moments (and need to offer ourselves grace, too). jessica, some people just seem to naturally have a more hopeful, joyful take on life, don’t they? I do believe, though, it’s an attitude I can practice and seek. My grandma inspires me to do that rather than to embrace bitterness and frustration. Meagan Francis, yes, I felt like I needed to explain to my kids why I wasn’t crying a lot. Then I realized they might feel like they were supposed to be crying, too, so if I talked openly about it, it would help them. I guess the lesson to learn is that being honest about where I am always helps my kids grow. I’m so sorry for your loss. I remember when my Mom passed away. My daughter was only 5; she’s 21 now. I remember her at the funeral home coloring and cutting out pictures that she wanted to give to Grandma. We placed them in the casket. That was my most important lesson that our kids know what they need at some level. It’s our job to listen well and help them express it. Trina, talking about feelings can be really hard, especially when we have to talk about them before we’ve had a chance to process them. But maybe they’re better—more real—in that form. What a beautiful, tear-jerking tribute. I’m so sorry for the loss. How lucky you are to have had such an enduring connection to her. Carmen, yes, I feel very lucky. I can’t wait to look at all the letters I wrote to my grandma so many years ago—won’t that be an amazing window into both my relationship with her and my past mind/life?